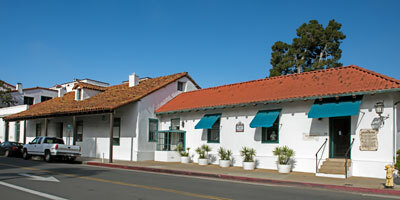 Constructed in 1849 by Don José de la Guerra, this adobe was originally used to house supplies brought in from ships anchored in the harbor. 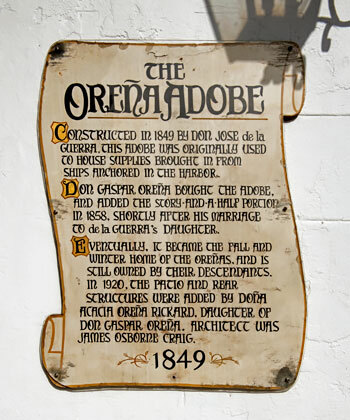 Don Gaspar Oreña bought the adobe and added the story-and-a-half portion in 1858, shortly after his marriage to de la Guerra's daughter. Eventually, it became the fall and winter home of the Oreñas, and is still owned by their descendants. In 1920, the patio and rear structures were added by Doña Acacia Oreña Rickard, daughter of Don Gaspar Oreña. Architect was James Osborne Craig. When we photographed the building in March of 2017, it housed an interior design studio.